RCB vs DC, IPL 2019: Royal Challengers Bangalore to lock horns against Delhi Capitals in Bengaluru: Virat Kohli led team's 5th defeat is hoping to show the better result this time. Virat Kohli had lashed out at his bowlers after RCB's bowlers failed to clinch the match from KKR. Kohli was far from pleased with the way his bowlers responded under pressure. 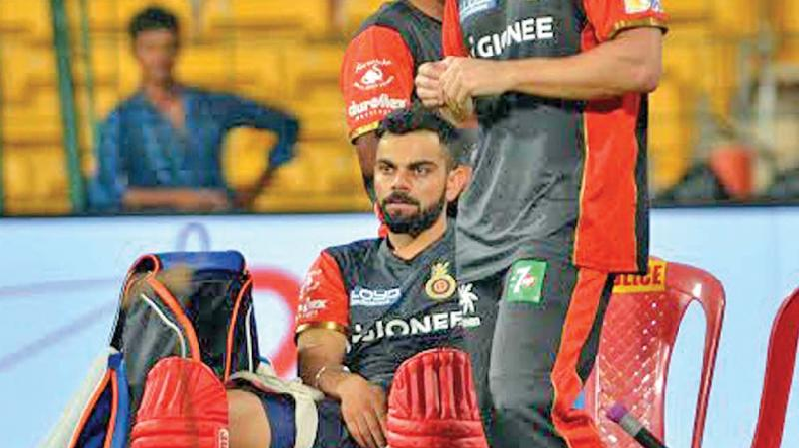 Royal Challengers Bangalore (RCB) will lock horns against Delhi Capitals (DC) at the Chinnaswamy Stadium in RCB vs DC, IPL 2019: Royal Challengers Bangalore to lock horns against Delhi Capitals in Bengaluruon Sunday. RCB is looking for their first win this season. RCB led by Virat Kohli had lost all their matches in the IPL 2019. Recently the team faced defeat against Kolkata Knight Riders at their home ground on Friday after a sensational effort from Andre Russell took the game away from the hosts. Despite posting an emphatic total of 205 runs on the board, RCB lost the game after Russell’s blistering 48 off just 13 balls. The defeat was RCB’s 5th this season in five games – their longest losing streak in IPL. Against Delhi Capitals, skipper Kohli will hope for a better show from the bowlers. Virat Kohli led team’s 5th defeat is hoping to show the better result this time. Virat Kohli had lashed out at his bowlers after RCB’s bowlers failed to clinch the match from KKR. Kohli was far from pleased with the way his bowlers responded under pressure. He had said if this is how his men went about their business then his team deserved to be at the bottom of the table. It has been a shocking slide for RCB over the last three seasons. In 2016, Virat Kohli had led from the front as RCB made it to the final. In 2017, RCB finished last after winning only 3 out of 14 matches. In 2018, RCB won a few more games but they finished only 6th in the points table. Delhi Capitals (DC) had the great start after its opener win over Mumbai Indians this season. DC have lost other games against Chennai Super Kings, Kings XI Punjab and Sunrisers Hyderabad while managing a close win over Kolkata Knight Riders in a thrilling Super Over. On a track which is likely to aide the batsmen, Delhi Capitals will back themselves to add to RCB’s miseries by extending their winless run. DC will be raring to bounce back against RCB in Bengaluru today and the team will hope to get their win against the RCB.